Banning bot use is a no-brainer but how will that practically be put in place? Will companies such as Ticketmaster be obliged to monitor and report any attempts to buy tickets in such a way? Will they be willing to invest in the security and personnel required to catch such nefarious activity? What is needed is legitimate secondary marketplaces operated by the primary ticket resellers. 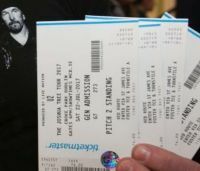 In Spain, Redtkts allows ticket buyers to resell tickets bought from them directly in an anonymous and safe marketplace with a cap of 15 per cent on the original price.